Includes a team entry plus a two night stay at the Econolodge at the Lake Elsinore Casino with lighted trailer parking! 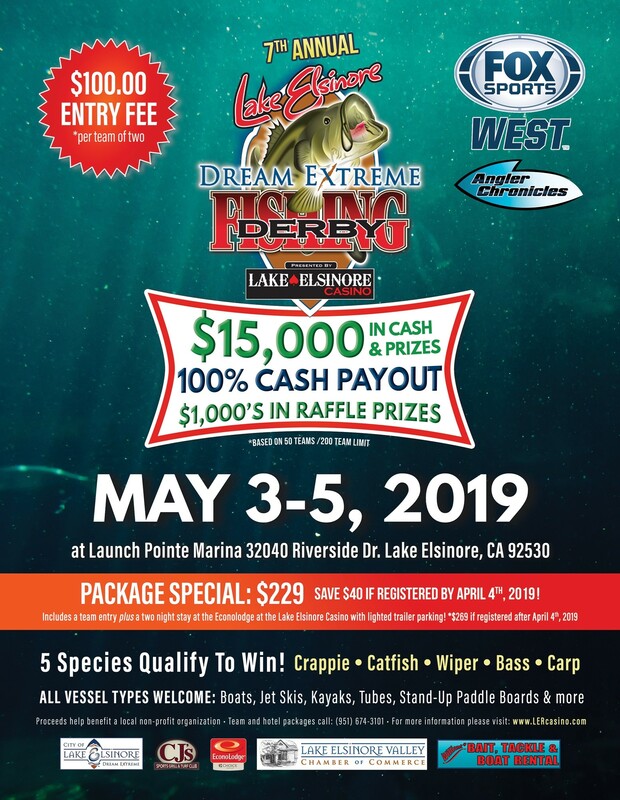 The 7th annual Fishing Derby presented by Lake Elsinore Casino will be held on May 3-5, 2019 at Launch Pointe Marina. Entry fee is $100 (per team of two). There will be $15,000 in cash and prizes. 100% cash payout with $1,000's in raffle prizes. This event will be broadcasted on Fox Sports West on Angler Chronicles. © 2013 Lake Elsinore Resort Casino. All Rights Reserved.